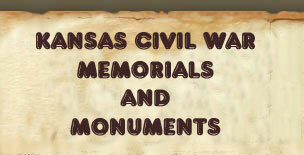 Description: The plaza at the base of the flagpole has a sign reading: "American Legion ~ Memorial". The crosses are labeled with individual names except for the rearmost which is labeled: "In Memory Of All". 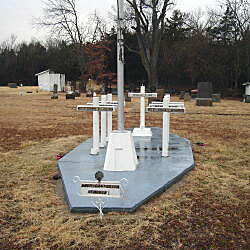 This cross has medallions mounted on it for Veterans of Foreign Wars, G.A.R., and American Legion. 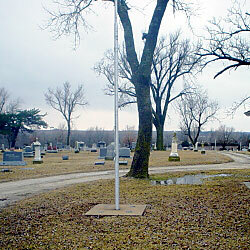 Description: A flagpole is mounted in the center of a concrete base. There are four brass medallions surrounding the flagpole. 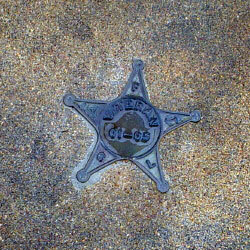 A star shaped medallion is inscribed: "Veterans 61-64 (with letters F, C, and L on the points of the star)". 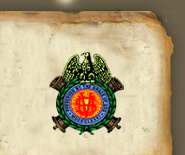 A cross shaped medallion is inscribed: "Spanish War Veterans 1898 - 1902 ~ Army ~ Navy ~ U.S.A. ~ Puerto Rico ~ Cuba ~ Philippine Islands". 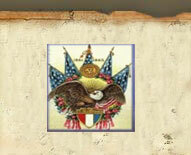 A round medallion is inscribed: "American Legion". A rosette shaped medallion is inscribed: "Veterans Of Foreign Wars".